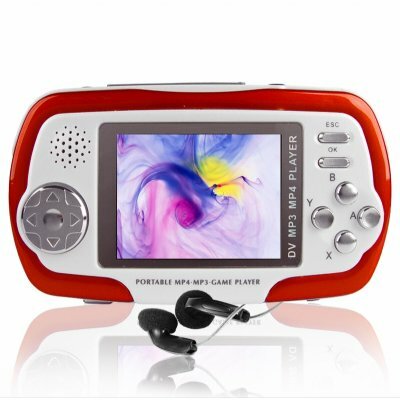 Successfully Added PMP Game + MP4 Player 1GB - 1.3MP Camera + SD Card Slot to your Shopping Cart. 1GB MP4 and video game player with a built in digital camera and camcorder with a SD/MMC memory card reader for expanding the memory 2 more GB's. It also features a large high quality 2.4 inch TFT display, D-Pad control, and customization options. This fun little gadget is perfect for almost any occasion and person. A great high profit E-bay reselling item, direct from China to you with free blind drop-shipping available and available at a low Chinavasion Wholesale price with no M.O.Q. (no minimum order quantity)..
Nice little unit. Screen is bright; video plays back smoothly. Audio is decent (with good headphones) and has plenty of volume. Camera isn't bad for such a small sensor. Buttons and D-pad controller have a good feel. However, I don't like the way the date is added to the lower right corner of every still image I take. Is there a way to turn that off? It doesn't quite compare to my Archos 402CC, but for 4X LESS money, this little gem is a bargain. Im dissapointed with this product.The mp3 player,its very basic,dont have any options,the layot is horrible.Dont have screen saver to save life battery.When you connect to charge the battery you cannot turn on the player, it shut down.The games are really bad,the pictures that we saw (like StreetFighter) is all false..the player run a poor emulator of old NES,and the games dont run perfectly..slowdowns,bugs and sound noises its what you have. There many fails on this device,maybe if they uptade the firmware by internet, it will be a good idea. on 2006-12-21 00:01:57 Only one thing prevents it from being great! This product is very good. The only thing that prevents it from being great is the fact that it cannot manage sub-directories, which forces me to have all pictures and videos on the folder /DCIM/100MEDIA, or all the mp3 album music files in folder /MP3. This is annoying and it would be great to have a rom update for this device with this very easy feature of using sub-folders to organize our files. the product brings all that it promisses it plays mp4 and wma and other type of sound files. the fact that it has the option of adding sd memory to it is great.the 2mpixel camera is surprisingly good but there is no flash or steady stream of light when you record videos or take pictures. most of the games have no problem running but favorites like mario, gradius, and contra (also many more) run too slow (even when you adjust the speed) to truly enjoy the game. besides the fact that some of the games run slow. the screen is a good size its light weight and not bulky. the video quality is good and does not blur. all in all its a preety decent buy but if they can fix the problem with the emulators it would be perfect.